We explore a new input device and a set of interaction techniques to facilitate direct manipulation of curves and surfaces. 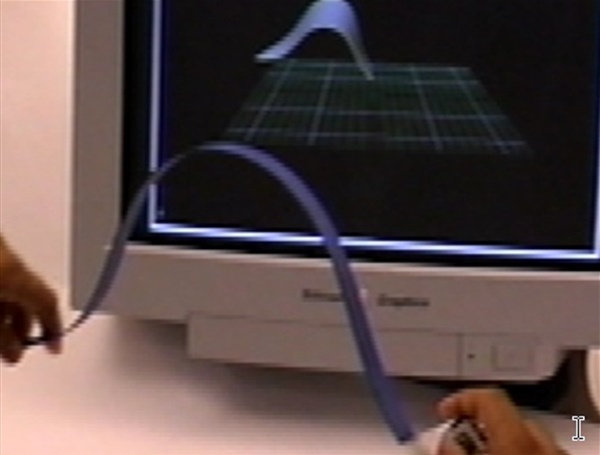 The input device, called ShapeTape™, is a continuous bend and twist sensitive strip that encourages manipulations that use both hands and, at times, all 10 fingers. We explore this input and interaction design space through a set of usage scenarios for creating and editing curves and surfaces as well as consider general interactions such as command access and camera controls. This investigation is carried out by extending Alias|wavefront’s modeling and animation package, Maya.